Fredericks & Freiser is pleased to announce Early Retirement, an exhibition of new drawings and paintings by Mark Thomas Gibson. Early Retirement shares a title with Gibson’s latest monograph published by Edition Patrick Frey, to be released in conjunction with this show. 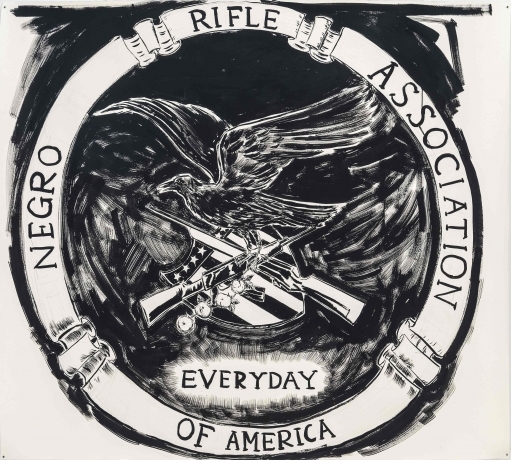 Both the solo exhibition and the artist’s book beg the crucial question: how do we find the strength to come together against relentless adversity in the United States of America? Gibson’s personal lens on American culture stems from his multipartite viewpoint as an artist—as a black male, a professor at Yale, an American history buff and comic book nerd. 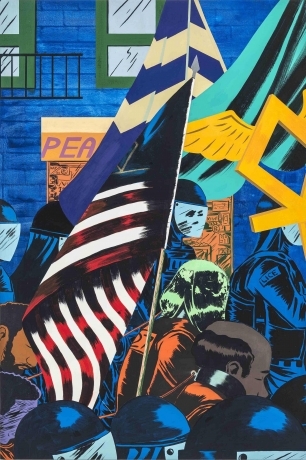 These myriad and often colliding perspectives fuel his exploration of American culture through the high and low visual languages of painting and comics to reveal a narrative that spells out our fabricated destruction. The black ink and strong color in his works create stark contrasts in which positive and negative space defines the compositions. He relies on a minimal aesthetic, playing off of both fine art and the comic book vernacular of sequential narrative. Gibson rarely edits his paintings and drawings, letting what he lays down take form organically, trusting the canvases to tell the truth. In all the works, Gibson shines a high key light on the grim and gritty social realities of contemporary America. These works implicate every viewer as a character in the dystopia they portend. They serve to remind us that though everything is at stake, we are all still in this narrative together. Early Retirement will have an opening reception at Fredericks & Freiser on September 7, from 6-8 pm. Additionally, there will be a book release on September 17 at McNally Jackson Books, NY. Mark Thomas Gibson (b. 1980 Miami, Florida) received a BFA from Cooper Union and an MFA from Yale University School of Art in 2013. He has been included in numerous group exhibitions and most recently co-curated with William Villalongo Black Pulp! at Yale University Art Gallery (traveling). This will be Gibson’s third solo exhibition at Fredericks & Freiser, following his debut solo show, Alamo Revenant in 2013, and Some Monsters Loom Large in 2016. The exhibition will be accompanied by the publication of Early Retirement, published by Edition Patrick Frey.